In Eugene Oregon, the city council has just voted to stop reciting the Pledge of Allegiance because it is “to divisive.” One council member compared it to reciting the communist manifesto claiming the pledge “has no place at city hall.”What’s happening to America reminds me of the frog in the boiling pot. The frog in the pot doesn’t notice the temperature gradually rising until it’s too late, finds himself too weak to jump out of the pot and ultimately cooks to death. During the past four years, we’ve lived in a nation where the change has been gradual enough that much of it went unnoticed – that’s so dangerous! I’ve put together four messages addressing the facts that catapulted America to greatness and perhaps, Her greatest threat. Dave has put together four messages addressing the facts that catapulted America to greatness and perhaps, Her greatest threat. 1. 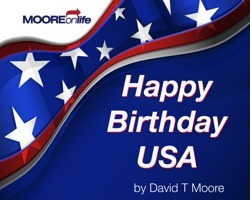 Happy Birthday USA is Dave’s most recent message focusing upon our American tradition. President Obama recently stated that America is not a Christian nation. The founders would strongly disagree. This message walks listeners through the amazing founding of America. 2. Time To Roar focuses upon the role that people of faith play in society and the government. Rooted in the words of Jesus and filled with contemporary illustrations, this message will move you to do your part in preserving America, as one nation under God. 3. The ACLU & U is an expose’ on how the ACLU is undermining our American tradition and history. It is a well organized and powerful organization with an army of lawyers and huge financial war chest. All of which is poised to secularize America. From restricting religious speech to making traditional marriage a thing of the past, the ACLU has made tremendous strides toward their goals. This message begins to explain the history of the ACLU and its purpose so you are more aware of what is going on. 4. Honor the Warrior is about how the Bible would have people of faith honor our returning warriors. From Europe to the Pacific to Korea to the Middle East to Central America, American warriors have made the world a safer place. We should be thankful for that. Romans 13:7 says that we should respect and honor all to whom it is due. Clearly, the men and women of the American military are worthy of our respect and honor. Bouncing back and fourth between stories of modern heroism and 2 Samuel chapter one, this Veterans Day message will inspire and instruct believers on how God would have us respond to the warriors among us.